Starbucked is written by Taylor Clark and I recommend it as it's well-informed, cogent, and entertaining. It's just the sort of book to read on a long flight. However, you might not end up reading much on the flight itself if you happen to sit next to folk who are easy to comment on anything Starbuckian. 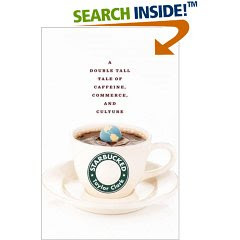 Starbucked reads fast and while it might not deter one from picking up another latte, it manages to contextualize the rise of the Starbucks Corporation most eloquently. And, what truly sells this book to me, is the way it weaves investigative journalism with cultural commentaries. It's, if nothing else, a witty interpretation of our contemporary culture. it's well reviewed everywhere. will check it out. he is very critical of Schultz, i hear, right? He is very critical of Starbucks aggressive growth and that seems to be the main issue he has with it.